Multiple Symetrix processors have been specified to provide powerful and versatile signal conditioning and routing at the newly constructed Monomoy Regional High School in Chatham, MA. 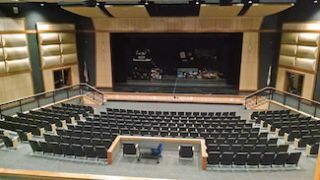 For the auditorium, project engineer Jay Vigneau chose the SymNet Edge frame because he could outfit it with a digital input card to pair with the output from the FOH digital mixer.Costing close to $60 million, the impressively equipped and eco-friendly new school is the result of a collaboration between the Cape Cod towns of Chatham and Harwich. Integral to realising their vision of a technologically advanced infrastructure is a flexible sound reinforcement system with five nodes focused on the auditorium, cafeteria, gymnasium, media center, and TV production studio. This was achieved through the efforts of two locally based operations: Cavanaugh Tocci Associates, which was charged with designing a sound system boasting the necessary flexibility, and SIGNET Electronic Systems, which undertook the installation and integration. Based on positive previous experience of the DSPs’ performance, the SIGNET team elected to use one Symetrix SymNet Edge DSP and three SymNet Radius 12x8 open architecture Dante-scalable DSPs to provide signal processing and routing, with three SymNet xIn 12 and SymNet xOut 12 expanders supplementing analogue inputs and output counts where required. The DSPs’ support for Audinate’s Dante media networking technology—allowing all of the nodes to be con-nected transparently and efficiently via the building’s ethernet cabling—was another important factor. For the auditorium, Vigneau chose the SymNet Edge frame because he could outfit it with a digital input card to pair with the output from the FOH digital mixer. The other nodes use SymNet Radius 12x8 processors, with Vigneau able to accommodate additional I/O requirements via SymNet xIn 12 and SymNet xOut 12 expanders, which integrate easily with the DSPs via Dante. Crestron processors supply an integrated user interface. “In the auditorium and elsewhere, the Symetrix DSPs provide comprehensive signal processing, including intelligent auto-mixing for simple events with modest input counts," Vigneau said. "The systems are pow-erful, but also very easy to use."